Robin van Persie: scorer of this many against Blackburn. Arsenal are coming off their most emphatic win in a long time, a 7-1 thrashing of Blackburn Rovers. But, in the end, that's three points in the table, and tomorrow's match at Sunderland is worth the same. Ultimately, winning by such a large margin means nothing if the Gunners don't use it as a springboard to bigger and better things. Dropping points on Wearside brings us right back to where we were after the 0-0 at Bolton, full of questions. The six fixtures which follow tomorrow's match are immense, building up to what could be an FA Cup quarterfinal. Arsenal travel to the San Siro for the first leg of the Champions League Round of 16 against AC Milan on Wednesday. They're back in Sunderland in a week's time for the fifth round of the FA Cup. A week later, it's the North London derby, followed a week later by Liverpool away, the second leg with Milan at the Emirates, then Newcastle (who are still in the hunt for the top four) at home. Who knows, there could even be an FA Cup replay in there if next Saturday's match ends level. All of these games are immense. So, why is this one league match so important? Obvious; it's the one that sets the tone for the coming month. Win this and anything can happen going forward, but lose or draw and the doubts and the questions and the criticism all comes flooding back. And really, nobody wants that at a time like this. Hopefully, by the third weekend in April, we can talk about how Arsenal's home meeting with Chelsea is the most important match of Arsenal's season, with the Gunners still in the battle for Champions League football. But, in order for that to be the case, then this difficult stretch of fixtures needs to start with three points tomorrow. The big news this week is that perma-hurt left back, Kieran Gibbs, is no longer listed above in the injury section. The 22-year-old has been back in training since last week and could appear off the bench tomorrow. Reports are that he will be named in the squad and then could start on Wednesday in the Champions League. Excellent news, considering it's been two months since Arsenal started a match with a natural left back at that position. There's bad news, of course, to temper this, and that is regarding Emmanuel Frimpong. The midfielder, who was on loan at Wolves, has torn cruciate ligaments in his knee and his season is over. It's important to note that this is not a recurrence of the cruciate injury that forced him to miss all of last season; it's in the other knee. It's unfortunate, since Frimpong was well liked at Molineux and really needs Premier League starts to be ready to feature for Arsenal. Another six month set-back is really NOT DENCH. Okay, every Google search just returns more news about Jack Wilshere. Apparently, it's an ultrasound system used to accelerate the healing of bone fractures. According to Exogen's Web site, fractures* (note: asterisk theirs) are just a bump in the road! Where the bump is significant pain and a hole in the Arsenal midfield and the road is most if not all of this season. Abou Diaby is back "earliest at the end of February," Carl Jenkinson was back running weeks ago, yet I haven't heard anything about him since before the United game, and Andre Santos is probably at least a month away now. The one other question in the squad, I believe, is how many games Bacary Sagna is match fit to start. Obviously, you want him playing at the San Siro, so do you rest him in this match, or is he fit enough to start both? Considering how important I said this match was, if I were in control, I'd start him. But what do I know? I'm typing this from my bedroom. 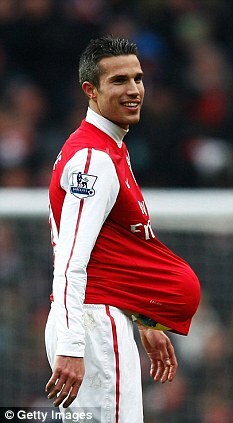 Predicted XI: Szczesny, Sagna, Koscielny, Mertesacker, Vermaelen, Song, Ramsey, Arteta, Oxlade-Chamberlain, Walcott, van Persie. Subs from: Fabianski, Coquelin, Gibbs, Rosicky, Arshavin, Benayoun, Henry. Wednesday, but his leg cramped in the process. Midweek goal scorer Stephane Sessegnon may not be fit to start tomorrow after cramping following Sunderland's extra time FA Cup replay win over Middlesbrough on Wednesday. The Benin international scored the winner in the 112th minute but then limped off the pitch at Riverside. Sessegnon has not missed a match for Sunderland this season, something new manager Martin O'Neill apparently did not realize until this week. The Black Cats are also dealing with a rather large sum of injuries to their side at the moment in addition to Sessegnon; only Manchester United have more players out through injury. Captain and generally classy fellow Lee Cattermole is expected to miss his fifth straight game with a hamstring injury. John O'Shea has worn the armband in his place. Fellow car-smasher and greatest striker to ever live Nicklas Bendtner has been unavailable due to facial injuries, though he would not be eligible to face his parent club anyway due to loan terms. Ah, but the list keeps going. Midfielder David Vaughan (ankle), and three defenders: ex-United Wes Brown (knee), Titus Bramble (calf), and Matt Kilgallon (ankle) are all expected to miss a few more weeks. Former number one goalkeeper Craig Gordon has been out with knee ligament damage since the end of last season. Martin! You look like a dork! Photo: Guardian. Sunderland are currently the league's in-form side, the only top flight team with five wins during their last six matches. It is obvious to see that the team have been rejuvenated under Martin O'Neill. 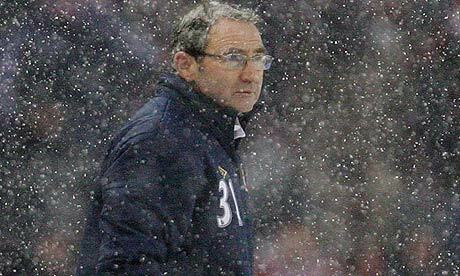 O'Neill took over as Black Cats manager on December 3 and the side slumped to a 2-1 loss at Wolves the following day. That loss dropped them to 17th in the table at that time. From there, Sunderland have lost twice, drawn once, and won seven league matches. Both losses came away from home (at Spurs and at Chelsea) by 1-0 scorelines. Only Everton have come out of the Stadium of Light with a point since O'Neill took over (a 1-1 draw on Boxing Day.) They have climbed to eighth in the table and are now just seven points behind Arsenal in sixth. That weekend in early December saw Arsenal win 4-0 at Wigan Athletic. In six road matches across all competitions since that day, Arsenal have won just once and drawn once, losing four. They lost at Olympiacos and Manchester City in December, then beat Aston Villa just before Christmas. In 2012 away from home, they lost at Fulham, lost at Swansea, then played a frustrating 0-0 draw at Bolton. Damn it, Phil Dowd! Photo: Daily Mail. Arsenal have struggled at the Stadium of Light in recent seasons (largely thanks to Darren Bent, though,) so it's not great news for the Gunners that they'll have to play there twice in the span of eight days. Arsenal's last win on Wearside was a 1-0 victory on May 11, 2008, the final game of that season. 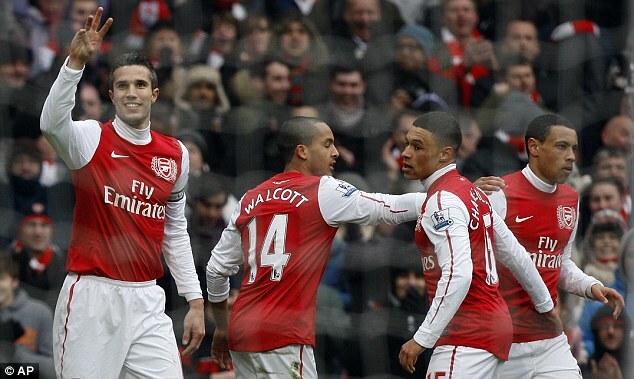 Theo Walcott had the lone goal on 24 minutes. Neither side had much to play for in that match: Arsenal were locked in third place and newly promoted Sunderland were not in danger of relegation, finishing 15th. The next season, Sunderland looked to have an 86th minute winner at the Stadium of Light, when Grant Ledbetter scored in the 86th minute, but the goal was canceled out by an injury time header from Cesc Fabregas off a corner, helping Arsenal escape with a 1-1 draw. In November of 2009, Sunderland took all three points at home thanks to a 1-0 win when Darren Bent scored in the 71st. Last year, a fluke Fabregas goal gave Arsenal a 1-0 lead, but in the second half, Alex Song was sent off, Tomas Rosicky missed a penalty (after Fabregas was removed through injury,) and Bent equalized in the 95th minute. So, Arsenal have not won in Sunderland in three tries, but it bears noting that Robin van Persie missed the last two through injury. Speaking of the Dutchman, RVP had both goals in the reverse fixture of this match, a 2-1 win at the Emirates in October. Van Persie's opening minute goal was the fastest league goal in Arsenal history, breaking a record that had been set by Marouane Chamakh at Molineux last year. The opener was canceled out by a perfectly taken free kick from ex-Gunner Sebastian Larsson in the 31st, but van Persie one-upped him with the winner from a set piece in the 82nd. with this guy. Photo: Daily Mail. The referee is Lancashire-based Neil Swarbrick, taking charge of his first career Arsenal match. He's been involved as the fourth official in two previous Arsenal games this season, both against Aston Villa (in the league in December and in the FA Cup two weeks ago.) He worked one Sunderland match last year, his first Premier League appointment, a 0-0 draw at Craven Cottage. Swarbrick has taken charge of only seven Premier League matches this season to date, plus two cup ties involving Premier League teams. The league matches include: Norwich's 1-1 draw with Stoke (hey, he showed Ryan Shawcross a yellow card, that counts for something,) Aston Villa's 1-1 draw with Newcastle, Newcastle's 1-0 win over Wigan, Manchester City's 5-2 Carling Cup win at Wolves, West Brom's 2-1 win over Bolton, Swansea's 0-0 draw with Villa, Norwich's 2-1 win at QPR (hey, he sent off Joey Barton for that headbutt; that also counts for something,) Liverpool's 5-1 FA Cup win over Oldham Athletic, and Villa's 2-2 draw with QPR last midweek. 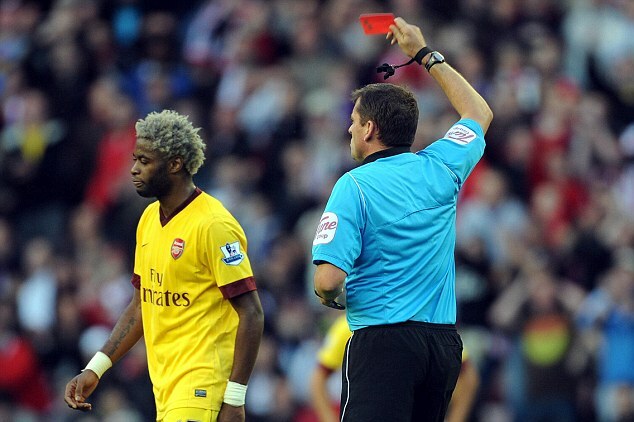 shown a lot of pictures of red cards in this preview. This weekend starts with a pretty big fixture, as Liverpool gets set to battle Manchester United at Old Trafford. The sides meet for the first time since Luis Suarez returned from suspension, the suspension he received for hurling racial abuse at Patrice Evra during the sides' first meeting of the season. That was a 1-1 draw on October 15 at Anfield. Liverpool got the better of United in the FA Cup, also at Anfield, on January 28, winning 2-1. United have beaten Liverpool in their last three meetings at Old Trafford; their last home loss to the Reds was by a 4-1 scoreline on March 14, 2009 (that was the last home loss in the series between the two dies.) 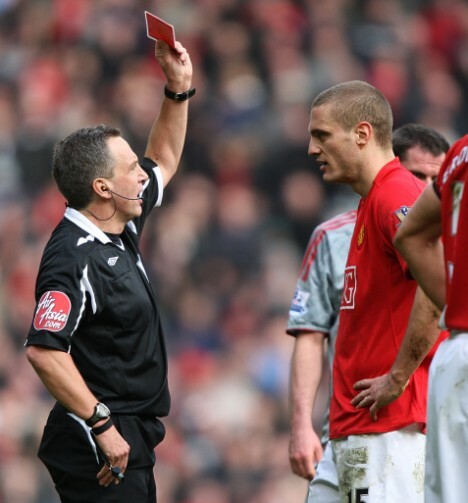 On that day, United were hampered by a red card to Nemanja Vidic when the match was 2-1. Tomorrow, it's Phil Dowd in charge, so, you know, expect some controversy. Sunderland v. Arsenal is one of six matches to kick-off in the standard 10:00 a.m. in New York City time slot. The other five will see Blackburn Rovers host Queens Park Rangers at Ewood Park. Both of these sides have now lost matches by six goals this season. There's only one other team in the league that has lost by six, and I've made myself sad by stating that fact. Bolton Wanderers host Wigan Athletic in a relegation six-pointer big enough to get Howard Webb as the referee. Meanwhile, Chelsea battles Everton at Goodison Park, Fulham hosts Stoke at the Cottage, and Swansea hosts Norwich in Wales. The late game sees Tottenham host Newcastle in North London. Two matches make up "Super Sunday" this week. First, Wolves host West Brom in the Black Country derby, then the weekend ends with another match in the West Midlands, as Aston Villa hosts Manchester City in Birmingham.